More than chemistry classes or learning how to do math, high school serves one purpose: to provide a place for teenagers to figure out who the hell they actually are. Sometimes these poor, puberty-inflicted souls get lucky, and the identity they stumble onto—or the identity that gets foisted upon them by others, more often than not—lines up with their private self-image. For the rest of them, high school becomes a kind of prison, where misery and despair lurk around every corner. Danganronpa: Trigger Happy Havoc makes that prison literal, complete with giant metal slabs bolted over every window and a host of students trapped inside with just their preconceived notions about each other (and themselves) to keep them company. The kids stuck in Hope’s Peak Academy show up with their surface identities already formed. Each of them is a prodigy: The Ultimate Martial Artist, The Ultimate Swimming Pro, even the Ultimate Fanfic Creator or Biker Gang Leader. Once the doors are locked and the killing games begin, those superficial identities become either the fuel that keeps them going or the thing that they’ll be running from for the rest of their short lives. The rules of Danganronpa’s deadly competition are simple. Sixteen teenagers are trapped in a school and told there’s only one way for one of them to escape: Kill one of their classmates and get away with the murder scot-free. 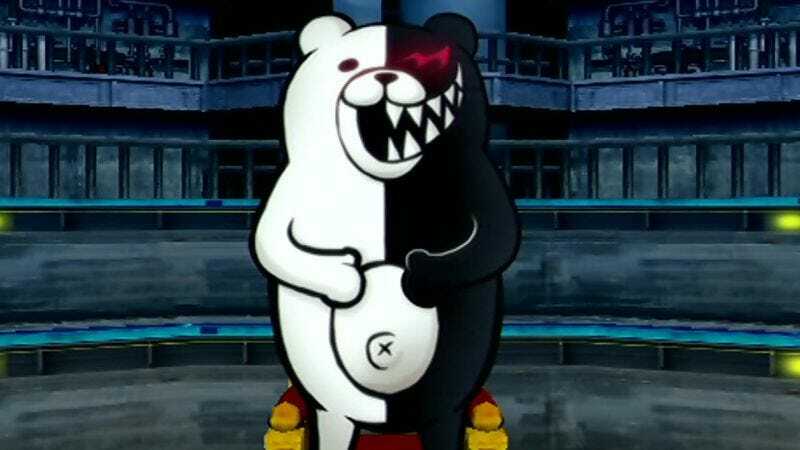 But while a few of the students are willing to kill right off the bat, most of them need a little prodding from the game’s malicious mascot, the monochromatic bear Monokuma, before they’ll let their bloodlust show. And so Monokuma starts handing out incentives to kill to his little cast of Hunger Games wannabes: bribes; threats to their families; and of course, hints that he’ll reveal their deepest secrets and true identities to their classmates, exposing their perceived weaknesses for all to see. That’s the incitement for the game’s second murder and a good example of the way Danganronpa actualizes the war for identity kids wage every day they’re stuck in school. Mondo Owada is the aforementioned “Ultimate Biker Gang Leader,” a ruffian with a bizarre haircut, a hot temper, and a terrible secret: He’s responsible for the death of his older brother, who gave his life to save him during a contest for control of their gang. It’s a lie Mondo’s entire life is built upon, to the point that Monokuma’s threats to reveal it to the world, and destroy the “biker gang leader” identity that he clings to, are enough to incite him to kill. And when he’s eventually revealed as the culprit by his classmates during one of the game’s periodic trials, it’s that same identity that takes his life. Strapped to a bike for one of the game’s grisly, ironic executions, he’s subjected to death by motorcycle, whirling around in a “cage of death” until his body literally liquefies. It’s a case of live by the identity, kill by the identity, die by the identity, and a reminder of the dangers of letting a facade take the place of the person you actually are. Meanwhile, Danganronpa presents a similar, if more troubling, scenario with the victim of Mondo’s crime. Chihiro Fujisaki isn’t warring with his role as the Ultimate Programmer but an aspect of his identity with which many high school students are forced to wrestle: his gender and the way he expresses it. When first met, Chihiro is presented to the player as female, and working out that he’s biologically male—and that Mondo killed him shortly after he revealed his secret to his biker friend—is key to unraveling the second case. To be clear, the game doesn’t handle this situation well. It’s outright stated that Chihiro dresses as a woman because he thinks he’s too weak to present as a man, without even acknowledging the idea that he might be transgender or just enjoy dressing in female clothing. (Not to mention the festering layer of misogyny lurking under the assumption that femininity equals “weakness.”) As an approach to handling a character or a real issue, it’s closed-minded and lacking nuance, but the messiness of its delivery still ties into the game’s overarching theme. Chihiro dies because his public identity and his self-image don’t match up. Ashamed of who he was, wracked with confusion and guilt over a core part of his being, the discrepancy between who he wanted to be and who the world decided to see him as eventually led to his death. And while it would be nice to think the consequences of that kind of disagreement—between our private selves and the public ones mandated to us by the world—would be less lethal in real-life high schools than they are in murder mystery video games, the statistics on suicide attempts by transgender people suggest that’s not the case. Everywhere you look in Danganronpa, there are teenagers at war with their own identities. There’s the Ultimate Baseball Star, who tries to hide his skills but is forced to fall back on them. There’s the Ultimate Pop Idol, who spends so much time putting a cheerful, sunny face on things that it drives her to madness. And in a case of someone who’s obsessed with acting according to their label, the Ultimate Affluent Prodigy is so invested in his superiority that he treats everyone around him like pieces in a cruel game. For 15 of the 16 students trapped in Hope’s Peak, there’s no escaping the identities and preconceived beliefs about themselves and those around them that they brought with them into the school. The 16th student is the exception. The player character, Makoto Naegi, barely has an “Ultimate” title at all. Chosen to attend Hope’s Peak by lottery, he’s known as the “Ultimate Lucky Student” and thus drags little baggage with him. And because he’s not blinded by the war between who he is and who he’s seen as, it’s Makoto who is able to see the truth behind the game’s many mysteries. He’s the one who fingers the culprit in each of the game’s climactic trials, and he’s the one who ultimately frees his friends. Unlike everyone else, Makoto’s not defined by who he used to be—he barely has a past identity at all—but by what he does. (It’s probably not a coincidence that his staunchest ally throughout the game is another student with little memory of her past.) Instead of fighting against an old identity, Makoto spends the entirety of Danganronpa building one for himself, to the point that he eventually emerges with a new title, the Ultimate Hope. That’s the dream, right? To graduate from some part of our life as exactly who we wanted to be, fresh and hopeful for the future. “Tomorrow, I’ll be the best possible version of myself.” Danganronpa captures that optimism, even in the face of Ultimate Despair. But it also doesn’t let you forget that the act of deciding who you’ll be today, right now, is a constant, wearying struggle against the weight of everyone you’ve been before—one that leaves a lot of broken bodies in its wake.